Glucocorticoid-induced TNF receptor family related protein (GITR) is present on many different cell types. Previous studies have shown that in vivo administration of an anti-GITR agonist mAb (DTA-1) inhibits regulatory T cells (Treg)-dependent suppression and enhances T cell responses. In this study, we show that administration of DTA-1 induces >85% tumor rejection in mice challenged with B16 melanoma. Rejection requires CD4+, CD8+, and NK1.1+ cells and is dependent on IFN-γ and Fas ligand and independent of perforin. 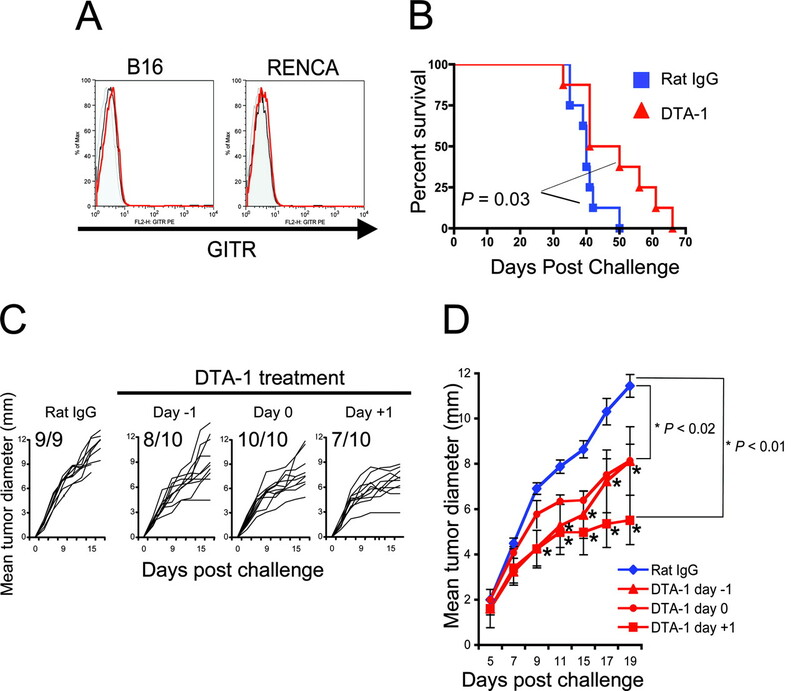 Depletion of Treg via anti-CD25 treatment does not induce B16 rejection, whereas 100% of the mice depleted of CD25+ cells and treated with DTA-1 reject tumors, indicating a predominant role of GITR on effector T cell costimulation rather than on Treg modulation. T cells isolated from DTA-1-treated mice challenged with B16 are specific against B16 and several melanoma differentiation Ags. These mice develop memory against B16, and a small proportion of them develop mild hypopigmentation. Consistent with previous studies showing that GITR stimulation increases Treg proliferation in vitro, we found in our model that GITR stimulation expanded the absolute number of FoxP3+ cells in vivo. Thus, we conclude that overall, GITR stimulation overcomes self-tolerance/ignorance and enhances T cell-mediated antitumor activity with minimal autoimmunity. The immune system can recognize and reject primary developing tumors, a concept known as cancer immunosurveillance. In melanoma, cancer immunity exists because the immune system’s repertoire contains autoreactive T and B cells that, when activated properly, may reject malignant cells that express unaltered or altered self-Ags (1). Because tumor Ags are often self-Ags, high-affinity T cells are either deleted in the thymus, remain ignorant, or become tolerant in the periphery, probably due to a population of CD4+CD25+ immunosuppressor regulatory T cells (Treg)3 (2). In mouse models, Ab depletion of Treg using anti-CD25 and anti-CD4 Abs has been demonstrated to increase rejection against chemically induced tumor and enhance vaccination against melanoma differentiation Ags (3, 4, 5, 6, 7, 8). Still, depletion of CD4+ and/or CD25+ T cells has little effect on the rejection of spontaneous tumors and may have a detrimental effect on the generation of CD8+ antitumor immunity (6). Other groups have shown a new strategy to inhibit Treg suppression, via the stimulation of glucocorticoid-induced TNF receptor (TNFR) family related protein (GITR), a member of the TNFR superfamily that is constitutively expressed at high levels on Treg (9, 10, 11, 12). GITR expression is not restricted to Treg, and recent studies have shown that although GITR stimulation inhibits Treg suppression (9, 10, 13), it also stimulates CD4+ and CD8+ T cells (12, 14, 15, 16, 17, 18). GITR stimulation has been shown to induce tumor rejection in a concomitant immunity model (19), and expression of GITR ligand on tumor cells can delay tumor growth and increase T cell infiltration (20). Therefore, we tested whether in vivo stimulation of GITR can break tolerance to differentiation Ags and enhance antitumor immunity to B16 melanoma. C57BL/6, BALB/c, Rag 1−/−, and IFN-γ−/−, pfp−/−, and gld mice (females, 8–10 wk old) were obtained from The Jackson Laboratory. All experiments were performed in accordance with our institutional guidelines. The B16F10 (B16) mouse melanoma cell line was originally obtained from I. Fidler (MD Anderson Cancer Center, Houston, TX) (21, 22) and passaged intradermally to ensure reproducible and aggressive tumor growth. TGL tumor lines (B16-TGL and RENCA-TGL) were generated by transducing B16 and RENCA with a retroviral vector containing a fusion reporter gene coding for HSV1-TK, enhanced green fluorescent protein, and firefly luciferase (23). After transduction, individual clones with high enhanced green fluorescent protein expression were sorted into 96-well plates using a FACSVantage DiVa (Becton Dickinson) cell sorter. Tissue culture medium consisted of RPMI 1640 supplemented with 10% heat-inactivated FCS, 100 U/ml penicillin, 100 μg/ml streptomycin, and 2 mM l-glutamine. C57BL/6 mice were challenged by intradermal inoculation of 3 × 104 or 1.2 × 105 (high dose) B16 cells, and tumor diameter was measured every 2 days. Mice rechallenged received an intermediate dose of B16 cells (6 × 104 cells). For tumor-free Kaplan-Meier curves, a mass of 2 × 2 mm was considered as (+) for tumor. For bioluminescence experiments, C57BL/6 or BALB/c mice received 1 × 105 cells of B16-TGL or RENCA-TGL i.v. and were given 150 mg/kg i.p. of D-luciferin (Xenogen). Fifteen minutes after D-luciferin injection, mice were anesthetized with isoflurane and placed into the Xenogen IVIS bioluminescence imaging system (Xenogen) in a supine position and recorded for 5 min. Pseudocolor images showing the whole body distribution of bioluminescent signal were superimposed on the conventional grayscale photographs. C57BL/6 mice were intradermally challenged with 3 × 104 B16 cells and treated with 1 mg/mouse of rat IgG control Ab (n = 50 mice) or DTA-1 (n = 50 mice) after 1, 4, and 9 days from challenge. Twenty-one days after challenge, spleens and draining inguinal lymph nodes were harvested and pooled. CD8+ cells and CD4+ were positively selected using MACS beads (Miltenyi Biotec). Purified cells (>98% purity) were adoptively transferred into Rag 1−/− hosts. Groups of 8–10 mice received either CD4+ cells alone (24 × 106 cells/mouse), CD8+ alone (12 × 106), or CD4+ and CD8+ at a 1:2 ratio (12 × 106 CD8+ and 24 × 106 CD4+ cells per mouse). One day after adoptive transfer, Rag 1−/− mice were challenged intradermally with 3 × 104 B16 cells, and tumor diameter was measured every 2 days. Mice received 1 mg/mouse of affinity-purified DTA-1 mAb (9) or rat IgG control Ab (Anogen) injected i.p. at the specified time points. Mice were depleted of Gr-1+ (clone Rb6-8C5), CD4+ (GK1.5), CD8+ (2.43), and NK1.1+ (PK136), and CD25+ cells (PC61) by i.p. injection of 500 μg of the mAbs (bioreactor supernatants) at days −7, −4, +4, and +7 from tumor challenge. For depletion of Treg before tumor challenge, mice were depleted with 500 μg of PC61 by i.p. injection at days −7 and −4. Flow cytometry was used to confirm >98% depletion of target cells for at least 7 days after the first injection. Anti-mouse CD16/CD32 FcR block (clone 2.4G2) and all of the following fluorochrome-labeled and purified Abs against murine Ag were obtained from BD Biosciences: CD4 (clone RM4-5), CD8 (53-6.7), CD62L (MEL-14), CD122 (TM-B1), CD44 (IM7), CD45R/B220 (RA3-6B2), Gr-1 (RB6-8C5), CD25 (PC61), CD69 (H1.2F3), isotype controls: rat IgG2a- (R35-95), rat IgG2a- (B39-4), rat IgG2b (A95-1), hamster IgG group 1 liter (Ha4/8), streptavidin-FITC, -PE, and -PCP. Biotinylated anti-murine GITR (BAF524) was obtained from R&D Systems. T cells were washed in PBS with 2% FBS and 0.1% sodium azide and incubated for 15 min at 4°C with anti-CD16/CD32 FcR block. Subsequently, cells were incubated for 30 min at 4°C with Abs and washed twice. Stained cells were analyzed on a FACSCalibur flow cytometer (BD Biosciences) with CellQuest or Flowjo software (Tree Star). For detection of FoxP3+ cells (eBioscience), splenocytes and draining lymph nodes were harvested, counted, and 10 × 106 cells were incubated in 2% paraformaldehyde at 37°C for 30 min, washed three times with PBS, and fixed in 80% methanol at −20°C overnight. Cells were washed three times with PBS and incubated with anti-CD16/CD32 FcR block for 15 min. Subsequently, cells were incubated with Ab against cell surface markers, incubated for 30 min at 4°C, washed twice in PBS, and analyzed by flow cytometry. Peptides analyzed were synthesized by Genemed Synthesis and used at >80% purity, as confirmed by HPLC. Peptides tested include the following: gp100/pmel 17 peptide gp10025–33 (24), dopachrome tautomerase/tyrosinase-related protein 2 (DCT) DCT181–188 (25) and DCT363–370, and TYRP1/gp75 (gp75), gp75455–462, gp75481–489, and gp75522–529 (J. A. Guevera-Patino, M. E. Engelhorn, M. J. Turk, C. Liu, F. Duan, A. D. Cohen, T. Merghoub, J. D. Wolchok, A. N. Houghton, submitted for publication.) For ELISPOT analysis (19), multiscreen-IP plates (Millipore) were coated with anti-mouse IFN-γ Ab in PBS (clone AN18; Mabtech), incubated overnight at 4°C, washed with PBS, and blocked with RPMI 1640 plus 7.5% FBS for 2 h at 37°C. CD8+ T cells were harvested from spleen and inguinal lymph nodes, purified using anti-CD4 and anti-CD8 MACS magnetic beads (Miltenyi Biotec), and plated at a concentration of 2.5 × 105 cells/well. B16 targets cells were pretreated for 24 h with Con A supernatant (T-Stim Culture Supplement Rat with CON A; BD Biosciences), detached using a nonenzymatic method (Cell Dissociation Solution (1×) Nonenzymatic; Sigma-Aldrich), irradiated, and plated at 1 × 104 cells/well. Target EL-4 leukemia cells were pulsed with 10 μg/ml peptide for 1 h and plated at 2 × 104 cells/well. After 20-h incubation for CD8+ T cells and 48 h for CD4+ T cells at 37°C, plates were washed with PBS plus 0.05% Tween and incubated for 2 h at 37°C with biotinylated Ab against mouse IFN-γ (clone R4-6A2; Mabtech). Spots were counted with an automated ELISPOT reader system with KS 4.3 software (Carl Zeiss MicroImaging). Log-rank analysis was performed using Kaplan-Meier curves. For all other analysis, nonparametric unpaired Mann-Whitney U test was used. We analyzed two solid tumor cell lines, the spontaneous melanoma B16 and renal cell carcinoma RENCA, and established that both tumor lines were negative for GITR expression (Fig. 1⇓A). To assess whether in vivo GITR stimulation could result in tumor delay or rejection, the agonist Ab against GITR (clone DTA-1) was injected into BALB/c mice challenged with RENCA-TGL (Fig. 1⇓B). Mice that received a single dose of DTA-1 the day before the challenge had increased survival when compared with the control group. This antitumor effect was confirmed in C57BL/6 mice challenged with B16 (without TGL) intradermally (Fig. 1⇓, C and D) or by tail vein (B16-TGL) and treated with a single dose of DTA-1 (data not shown). A single dose of anti-GITR agonist (DTA-1) induces a delay in tumor progression. A, GITR surface expression of B16 and RENCA tumor cell lines (gray histogram, unstained cells; black line, isotype control; red line, DTA-1). B, Kaplan-Meier survival curve of BALB/c mice challenged i.v. with 1 × 105 RENCA-TGL cells and treated with a single dose of rat IgG control Ab or DTA-1 (1 mg/mouse) 1 day before the challenge. C, C57BL/6 mice challenged intradermally with 1 × 105 B16 and treated with a single dose of rat IgG control Ab or DTA-1 (1 mg/mouse) at different time points of tumor challenge. D, The data represent the mean size of intradermal tumors per group at different time points after challenge. All data are representative of two independent experiments (n = 10–15 mice per group). We analyzed GITR expression on different effector populations of the adaptive and innate immune system (data not shown). GITR was present at low levels on B cells, at intermediate levels on CD4+, CD8+, NK, NKT cells, granulocytes, and macrophages, and at high levels on Treg. DTA-1 treatment at day +1 reduced tumor growth more effectively than the other regiments, suggesting that costimulation of effector T cells by DTA-1 was more important for tumor rejection than the modulation of Treg. Based on this rationale, we decided to administer DTA-1 three times, starting 1 day after tumor inoculation (Fig. 2⇓). Most mice that were challenged with a high dose (Fig. 2⇓A) or low dose of B16 (Fig. 2⇓B) and treated three times with DTA-1 rejected the tumor. Next, we examined the contribution of Gr-1+, CD4+, CD8+, and NK1.1+ cells in tumor rejection by depleting the host with specific Ab. 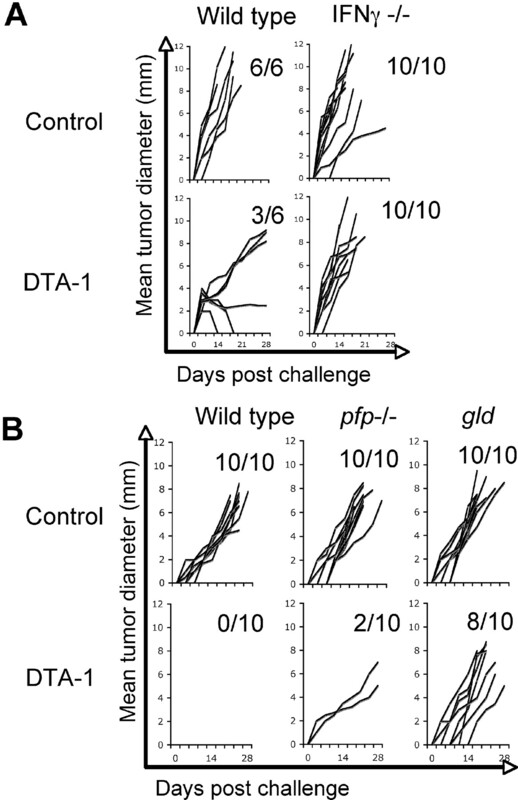 Gr-1 depletion had no impact on DTA-1-mediated tumor rejection (Fig. 2⇓C), whereas mice depleted of CD4+ cells (Fig. 2⇓D), CD8+ cells (Fig. 2⇓E), or both (Fig. 2⇓F) were unable to reject B16, even in the presence of DTA-1, indicating that T cells are necessary for DTA-1-induced tumor rejection. Mice depleted of NK1.1+ cells (Fig. 2⇓G) developed tumors rapidly, and addition of DTA-1 was associated with only low levels of rejection comparable to the nondepleted rat IgG control group, indicating that NK/NKT were also required for B16 rejection, which is consistent with other published experiments (26, 27). Prior studies have indicated that anti-CD25 Ab depletion of Treg can enhance antitumor immunity against highly immunogenic tumors but has little or no effect against nonimmunogenic tumors (3, 4, 5, 6, 7). Experiments treating B16 with anti-CD25 administration range from a delay in B16 progression without rejection (7) to low rate rejection (3). Our results show a delay in B16 progression in CD25-depleted mice compared with the control group, although this result did not reach statistical significance. Addition of DTA-1 to anti-CD25 did not result in improved tumor protection (Fig. 2⇓H). Because the presence of the Ab can be detected up to 15–21 days after the first injection (3), these results are consistent with abrogation of immunity due to a block in IL-2 signaling by the anti-CD25 Ab (28, 29, 30) or, alternatively, depletion of recently activated effector cells (6). Rag 1−/− mice that lack T and B cells, but have increased NK activity, were challenged with B16 and treated with DTA-1 or control Ab (Fig. 2⇓I). No difference in tumor take was observed between these two groups. Overall, these results confirm that both T and NK cells are required for tumor rejection. Three doses of DTA-1 induce B16 rejection that requires T cells and NK/NKT cells. Kaplan-Meier tumor-free curves of C57BL/6 mice treated with control Ab or DTA-1 after intradermal B16 challenge. All mice received 1 mg/mouse of DTA-1 Ab (DTA-1 treatment) or rat IgG control Ab (Rat IgG treatment) on days +1, +4, and +9 after challenge. A, Mice were challenged with B16 at a high dose (1.2 × 105 B16 cells). B, Mice were challenged with B16 at a low dose (3 × 104 B16 cells). C–H, Control groups included mice challenged with B16 (3 × 104 cells) and treated with DTA-1 or control Ab (DTA-1 treatment and Rat IgG treatment). Depletion groups included mice challenged with B16, treated with DTA-1 or rat IgG Ab, and also depleted of the following: Gr-1+ (C), CD4+ (D), CD8+ (E), CD4+ and CD8+ (F), NK1.1+ (G), and CD25+ (H). Depletions were done by i.p. injection of 500 μg Ab/mouse at days −7, −4, +4, and +7 of tumor challenge. These groups are designated as Depletion + rat IgG and Depletion + DTA-1. I, Rag 1−/− mice were challenged with B16 (3 × 104 cells) and treated with DTA-1 (DTA-1 treatment) or rat IgG control Ab (Rat IgG treatment). All data are representative of at least two independent experiments (n = 10–20 mice per group). To discriminate between the effects of DTA-1 on Treg from that on effector T cells CD25 depletion was done twice, at 7 and 4 days before tumor inoculation (Fig. 3⇓A). Mice depleted of CD25+ cells and treated with control rat IgG developed tumors at the same rate as nondepleted mice treated with the control Ab. All mice depleted of CD25+ and treated with DTA-1 rejected tumors, whereas 80% of nondepleted mice treated with DTA-1 rejected tumors. Although CD25 depletion and DTA-1 treatment seemed to be enhancing tumor rejection, the comparison between both groups did not reach statistical significance. These results indicate that DTA-1 rejection of B16 is dependent on effector T cells rather than abrogation of Treg suppression. DTA-1-induced rejection of B16 is predominantly mediated by costimulation of effector cells rather than modulation of Treg. Kaplan-Meier tumor-free curves of C57BL/6 mice treated with control Ab or DTA-1 after intradermal B16 challenge. All mice received 1 mg/mouse of DTA-1 Ab or rat IgG control Ab on days +1, +4, and +9 after challenge. A, Control nondepleted mice were treated with DTA-1 or rat IgG Ab (Rat IgG treatment or DTA-1 treatment). Two groups of mice were depleted of CD25+ cells by injection of 500 μg of Ab per mouse 7 and 4 days before B16 challenge. One group received DTA-1 (CD25 depletion + DTA-1), and the other group received the control Ab (CD25 depletion + rat IgG). All mice were challenged intradermally with 3 × 104 B16 cells. B, Adoptive transfer of T cells from tumor-bearing DTA-1-treated mice protect Rag 1−/− mice from B16 challenge. C57BL/6 mice were challenged intradermally with 3 × 104 B16 cells and treated with 1 mg/mouse of DTA-1 Ab or control rat IgG Ab 1, 4, and 9 days after challenge. On day 21, CD4+ and CD8+ T cells purified from splenocytes and lymph nodes of tumor-bearing mice were adoptively transferred at a 2:1 ratio into Rag 1−/− mice. One day after transfer, Rag1−/− recipients were challenged intradermally with 3 × 104 B16 cells. A control group of mice did not receive T cells (No T cells). Mice that received T cells from donors treated (Tx) with control rat IgG Ab are labeled as CD4, CD8, and CD4+CD8 from rat IgG Tx, and mice that received T cells form DTA-1-treated donors are labeled as CD4, CD8, and CD4+CD8 from DTA-1 Tx. Comparisons between all groups that received cells from rat IgG-treated mice (blue lines) vs all groups that received T cell from DTA-1-treated mice (red lines) are statistically significant (p < 0.04). To demonstrate whether T cells were sufficient for tumor rejection, CD4+ and CD8+ cells purified from spleens and draining lymph nodes of mice challenged with B16 and treated with DTA-1 or control Ab were adoptively transferred into Rag 1−/− recipients (Fig. 3⇑B). One day after transfer, the recipients were challenged with B16 cells. Transfer of CD4+, CD8+ T cells, or both derived from mice treated with control Ab and challenged with B16 did not affect tumor growth. 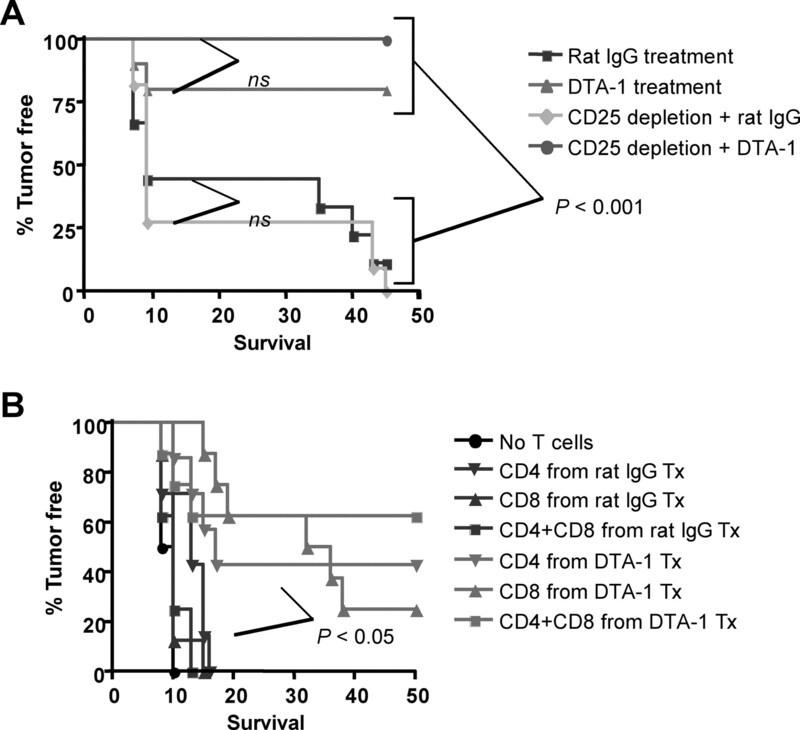 Conversely, transfer of T cells derived from mice treated with DTA-1 and challenged with B16 (CD4+, CD8+, or both) resulted in significant rejection of B16. To test the therapeutic effect of anti-GITR stimulation, DTA-1 treatment was delayed until mice were bearing tumors of 3-mm mean diameter. Mice were treated with DTA-1 (1 mg/mouse) 10 and 14 days after challenge. None of the mice under these conditions were able to reject the B16 challenge (data not shown). Because B16 is a highly aggressive tumor, it remains to be established whether in slower progressive tumors, anti-GITR demonstrates therapeutic effects. A number of studies have demonstrated a role for IFN-γ in tumor immunity (31, 32). To test whether IFN-γ was relevant for GITR-mediated tumor rejection, IFN-γ−/− and wild-type mice were treated with DTA-1 and challenged with B16 (Fig. 4⇓). IFN-γ−/− mice treated with DTA-1 were not protected from B16 challenge, demonstrating that this cytokine is required for DTA-1-mediated tumor rejection. We next tested the requirements for perforin and FasL in this system. All pfp−/− mice challenged with B16 and treated with control Ab developed tumors (10 of 10 tumor-bearing mice), whereas most pfp−/− mice treated with DTA-1 showed rejection (2 of 10 tumor-bearing mice). Mice deficient in FasL (gld) challenged with B16 develop tumors (10 of 10 tumor-bearing mice), whereas DTA-1 treatment did not enhance tumor rejection (8 of 10 tumor-bearing mice). We conclude that perforin is not required for GITR-mediated tumor rejection, whereas IFN-γ and FasL are required for B16 rejection. DTA-1-induced tumor rejection is dependent on IFN-γ and FasL and independent of perforin. A, Wild-type and IFN-γ−/− C57BL/6 mice were treated with control Ab or DTA-1 and challenged intradermally with 3 × 104 B16 cells. All mice received Ab at 1 mg/mouse on days +1, +4, and +9 after challenge. Data are representative of two independent experiments (n = 6–10). B, Wild-type, perforin−/− (pfp−/−), and FasL-deficient (gld) C57BL/6 mice were treated with control Ab or DTA-1 and challenged intradermally with 3 × 104 B16 cells. All mice received Ab at 1 mg/mouse on days +1, +4, and +9 after challenge. Data are representative of two independent experiments (n = 10). To examine Ag specificity of T cells during tumor rejection, mice were challenged with B16, treated with DTA-1 or control Ab, and analyzed by IFN-γ ELISPOT (Fig. 5⇓, A and B). Mice that received B16 and DTA-1 demonstrated T cell responses against three melanoma differentiation Ags (gp100, TYRP1/gp75, and DCT for CD8+ responses) and against syngeneic B16 cells (for CD4+ and CD8+ responses). Mice that received B16 and control Ab showed no detectable IFN-γ-producing T cells. Interestingly, even though these peptide-specific responses were only detected in the DTA-1 group, low-level responses also existed against negative controls (syngeneic EL4 pulsed with irrelevant peptide or syngeneic splenocytes) (Fig. 5⇓A), suggesting some recognition of self-Ags during early tumor progression. Furthermore, at day 34 after challenge, control animals bearing tumors still remained tolerant/ignorant to these Ags, whereas Ag-specific responses were detected in the DTA-1-treated group that rejected tumor (Fig. 5⇓B). DTA-1-treated mice that reject B16 recognize melanoma differentiation Ags. 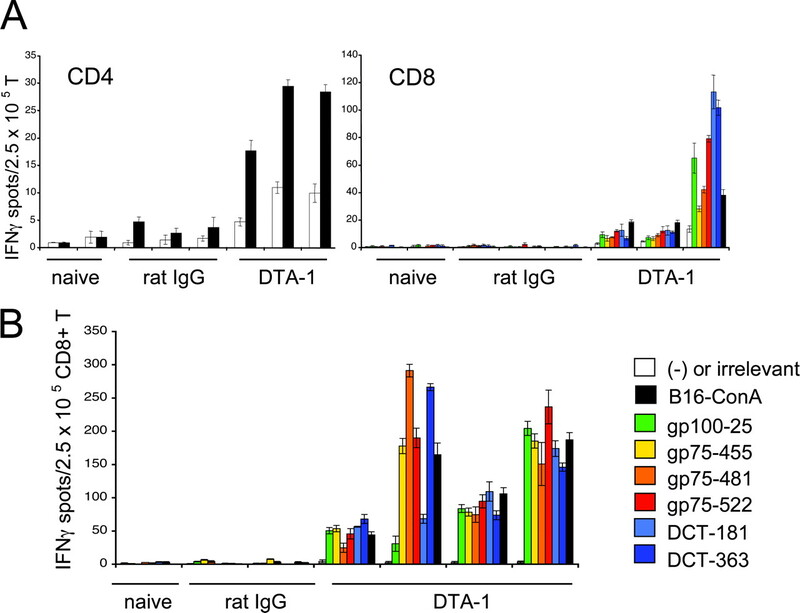 T cells from naive mice (naive) or mice challenged with 3 × 104 B16 cells treated with rat IgG control Ab (rat) or DTA-1 (DTA) were purified at day 7 (A) and day 37 (B) and tested in IFN-γ ELISPOT assays against EL4 cells pulsed with peptides or against syngeneic B16 tumor pretreated with Con A supernatant. A, CD4+ T cell (left panel) and CD8+ T cell (right panel) IFN-γ spots at day 7 postchallenge from unchallenged mice (naive; n = 2 mice), mice challenged with B16 and treated with rat IgG control Ab (rat; n = 3), and mice challenged with B16 and treated with DTA-1 (DTA-1; n = 3). B, CD8+ T cell IFN-γ spots at day 37 postchallenge, from unchallenged mice (naive; n = 1), challenged mice treated with rat IgG control Ab (rat; n = 2), and challenged mice treated with DTA-1 (DTA-1; n = 4). To test whether memory against B16 was established in mice that received DTA-1 and rejected tumor, mice were re-challenged 60–140 days after the primary challenge. Although all naive control mice rapidly developed tumors, only 23% of mice rechallenged with B16 developed tumors (Table I⇓). These results are consistent with the generation of a memory response against B16. Careful examination of coat color demonstrated that a small proportion of mice (5 of 43 mice) that were treated with DTA-1 and rejected B16, developed signs of mild depigmentation (Table I⇑). Two mice presented mild salt and pepper hair hypopigmentation, whereas the remaining three developed one or two 2- to 3-mm2 patches of hypopigmented hair at the site of tumor challenge. No change in coat color was detected in mice treated with control Ab and challenged with B16. These results indicate that mild autoimmunity was induced in a small subset of DTA-1-treated mice. To test whether DTA-1 had an effect on augmenting T cell activation, mice were challenged with B16, treated with DTA-1, and sacrificed 7 days after tumor challenge. The analysis of T cell activation markers showed a significant increase in the absolute numbers of CD4+CD44high T cells (Fig. 6⇓A). We gated on CD44 and CD62L (Fig. 6⇓B) to determine the percentage of central memory (CD44high and CD62L+) vs effector T cells (CD44high and CD62L−). There was a significant increase in the percentage of effector T cells in the DTA-1-treated mice compared with control mice (Fig. 6⇓C). We also noted an increased percentage of CD44highCD4+ and CD8+ T cells in draining lymph nodes of the DTA-1-treated group compared with control mice (Fig. 6⇓D). GITR stimulation increases CD4+ and CD8+ T cell activation. Spleens from C57BL/6 mice intradermally challenged with 3 × 104 B16 cells and treated with a 1 mg/mouse of rat IgG control Ab or DTA-1 at days +1 and +4 were harvested at day 7 and analyzed by flow cytometry. A, Splenic T cells gated on CD3+, CD4+, or CD8+, and CD44high. B, Analysis of T cells gated on CD3+, CD4+, or CD8+, comparing CD44 vs CD62L expression. C, Percentage of T cells gated on CD44−CD62L+ (black), CD44−CD62L− (light gray), CD44highCD62L− (dark gray), and CD44highCD62L+ (white) in the right panel. D, Inguinal draining lymph nodes (DLN) and nondraining lymph nodes (NDLN) from animals treated with rat IgG control Ab or DTA-1 were harvested 7 days after tumor challenge, pooled, and analyzed by flow cytometry. Data are representative of two independent experiments (n = 4 mice per group). ∗, p < 0.05. Previous studies have demonstrated that GITR-stimulated Treg proliferate in the presence of IL-2 (11, 12, 13, 16, 33). We repeated these experiments and found that, indeed, Treg in the presence of CD3 stimulation and IL-2 readily expand, and proliferation is increased in the presence of CD28 or DTA-1 (data not shown), confirming its costimulatory role on Treg. We next tested whether systemic administration of DTA-1 to naive hosts could expand the absolute number of CD4+CD25+ T cells. 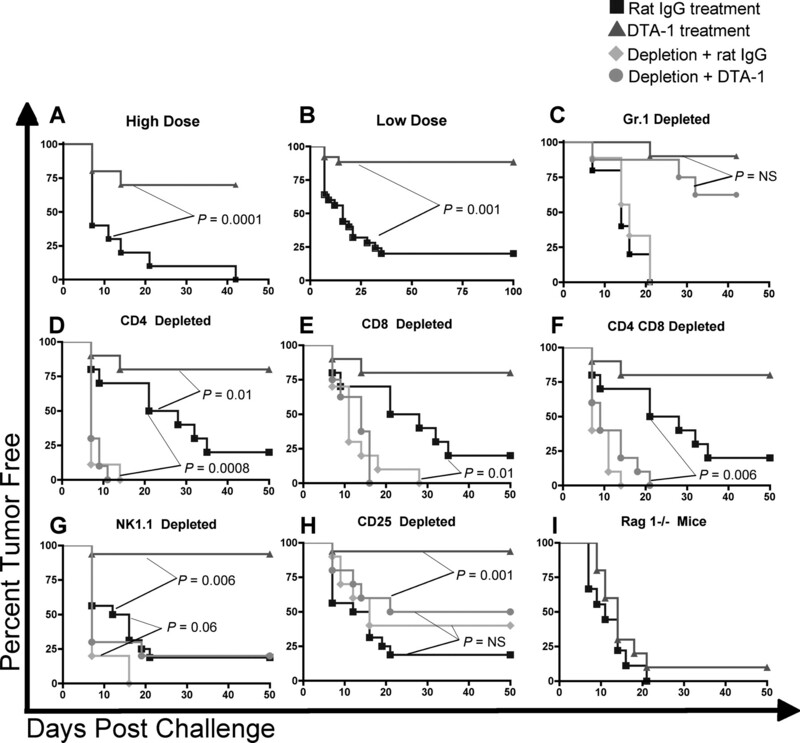 In both C57BL/6 and BALB/c mice, weekly treatments with 1 mg/mouse of DTA-1 increased the absolute number of CD4+CD25+ T cells compared with mice treated with control Ab (data not shown). Because in vivo GITR stimulation expands Treg, we tested whether once Treg had been stimulated through GITR, the expanded cells could still suppress effector T cells. High precursor frequencies and strong proliferation is observed during allogeneic responses, thus we used this model to test suppression (Fig. 7⇓). Treg were purified and cultured with anti-CD3 and anti-GITR for a week and subsequently tested in a MLR (Fig. 7⇓A). GITR-stimulated cultured Treg were able to suppress alloactivation of CD4+CD25− and CD8+CD25− to a better extent than fresh Treg. Cultured Treg are better suppressors than freshly isolated Treg, presumably due to the fact that all GITR-cultured Treg added to the MLR had been polyclonally stimulated with anti-CD3. Next, we tested whether Treg isolated from mice treated with DTA-1 maintained a suppressive activity ex vivo (Fig. 7⇓B). Naive mice were treated with 1 mg/mouse of a control Ab (rat IgG) or with DTA-1. Twenty-four hours after treatment, Treg were isolated and tested in a MLR. Treg derived from DTA-1-treated mice were equally efficient at suppressing alloactivation than Treg derived from the control group. These results suggest that once GITR stimulation has occurred, Treg regain their suppressive activity. Prior GITR stimulation does not impair Treg suppression. A, Treg cultured in vitro under GITR stimulation. Sorted C57BL/6 CD4+CD25+ T cells (postsort purity >98%) cultured in vitro for 7 days in the presence of anti-CD3 (1 μg/ml), DTA-1 (10 μg/ml), and IL-2 (100 U/ml) (Cult. Treg) or freshly sorted CD4+CD25+ T cells (Fresh Treg) were added to a MLR at a 1:1 ratio with responding T cells. MLR consisted of responding C57BL/6 CD4+CD25− or CD8+CD25− T cells (1 × 104/well) stimulated with irradiated BALB/c splenocytes (2 × 104/well) (Stimulators). B, Treg isolated from DTA-1-treated mice. Sorted CD4+CD25+ T cells (postsort purity >98%) from naive C57BL/6 mice treated (Tx) with 1 mg/mouse of DTA-1 Ab (Treg from DTA-1 Tx) or control Ab (Treg from rat IgG Tx) 24 h before Treg purification were added to MLR at a 1:1 ratio with responding T cells. MLR consisted of responding C57BL/6 whole T cells (T cells) (1 × 104/well) stimulated with irradiated BALB/c splenocytes (2 × 104/well) (Stimulators). The data represent thymidine incorporation for 18 h after 3 days of culture. ∗, p < 0.05. To test the role of DTA-1 administration on Treg expansion in tumor-bearing mice, T cells from spleens and lymph nodes of mice challenged with B16, treated with DTA-1, and sacrificed 12 days after tumor challenge were analyzed by flow cytometry (Fig. 8⇓). It has been demonstrated that FoxP3 is a required and restricted marker for natural Treg (34, 35). Mice treated with DTA-1 have increased percentage and absolute number of splenic FoxP3+ cells. The percentage of FoxP3+ in lymph node from these mice compared with the control group was similar, but the absolute number of these cells was increased in the DTA-1-treated group (data not shown). 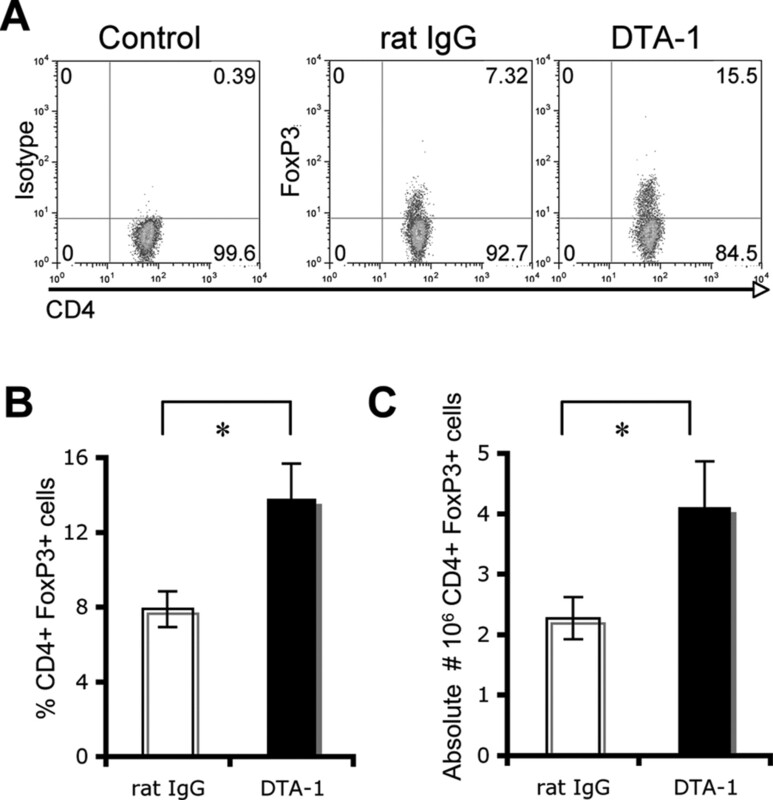 These results demonstrate an expansion of FoxP3+ cells after DTA-1 treatment and are consistent with previous studies demonstrating that GITR stimulation induces Treg proliferation in vitro (11, 12, 13, 16, 33). GITR stimulation induces the expansion of CD4+FoxP3+ cells in tumor-bearing mice. Mice were challenged intradermally with 3 × 104 B16 cells and treated with either rat IgG control Ab or DTA-1 Ab after 1, 4, and 9 days from tumor challenge. Mice were sacrificed 12 days after tumor challenge, and splenocytes were analyzed by flow cytometry. A, Representative flow cytometry analysis of splenocytes including an isotype control (Control), treatment with control Ab treatment (rat IgG), and treatment with anti-GITR agonist Ab (DTA-1). Percentage (B) and absolute number (C) of CD4+FoxP3+ cells in spleens. Data are representative of two independent experiments (n = 4 mice per group). ∗, p < 0.05. Our results indicate that GITR stimulation overcomes tolerance/ignorance to self-Ags (melanoma differentiation Ags), induces tumor rejection that requires T and NK/NKT cells, and is dependent on IFN-γ and FasL, but independent of perforin. In vivo GITR stimulation induces potent rejection and memory against B16, whereas it induces mild hypopigmentation and expansion of FoxP3+ cells. We sought to explore the mechanism of B16 tumor rejection. 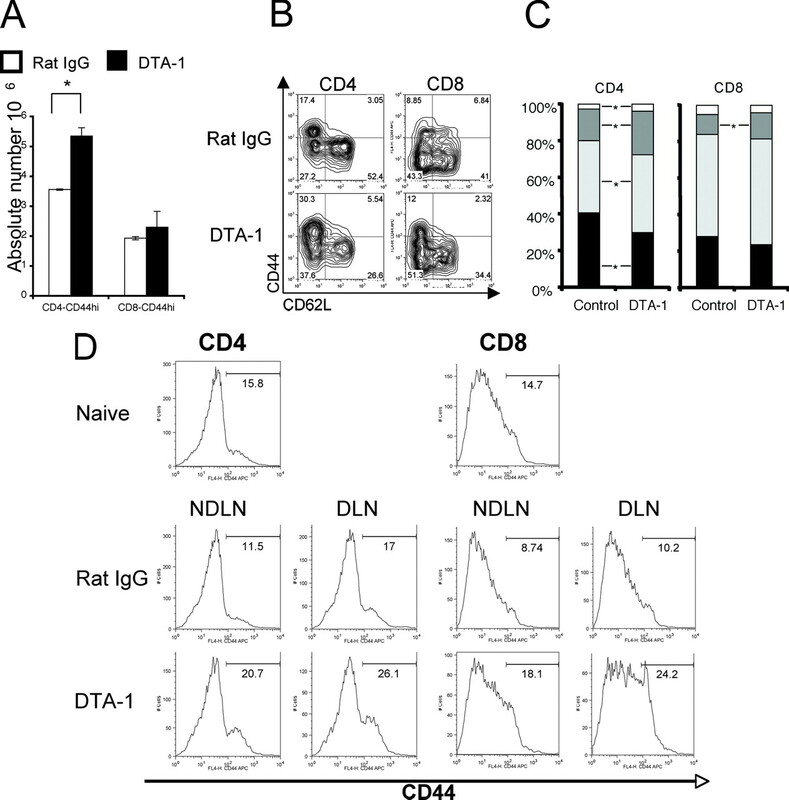 Adoptive transfer of T cells derived from DTA-1-treated donor demonstrates that CD4+ and CD8+ T cells are sufficient for GITR-mediated rejection of B16. Although most studies implicate CD8+ T cells at the effector arm of tumor rejection, as our results also demonstrate, it was unexpected to identify B16 rejection mediated by CD4+ T cells derived from DTA-1-treated mice. Studies have shown that CD4+ T cells that infiltrate tumors contain perforin granules and have the potential to kill by Fas/FasL system (36, 37). Because class II Ags are expressed in different solid malignancies including melanoma (38, 39), CD4+ T cells may target these tumors directly and secrete IFN-γ to activate macrophages that reject the tumor. Alternatively, in antitumor responses against class II-negative tumors, the melanoma tumors may be cross-presented by host APC that activate CD4+ T cells. Once activated in the lymph node, CD4+ T cells migrate back to the tumor, where they become activated by macrophages that present class II-restricted tumor Ags. Once locally reactivated, CD4+ T cells generate IFN-γ-activating macrophages and NK for tumor lysis (40). A similar IFN-γ-dependent mechanism may operate in GITR-mediated CD4+ rejection of B16. Although IFN-γ up-regulates the expression of class I and induces the expression of class II on B16 cells cultured in vitro, expression of class I and class II in B16 cells harvested from tumor-bearing mice is heterogeneous for both molecules (data not shown). Because the recipients of the immunized T cells were Rag 1−/− mice, it is possible that tumor-specific CD4+ T cells migrate to the tumor, become reactivated, secrete IFN-γ, target the tumor directly, and/or activate macrophages and NK cells that eradicate B16. Importantly, because the purified cells used in the adoptive transfer were not depleted of CD25+ cells before transfer into Rag 1−/− recipients, the CD4+ immune cells contained normal numbers of Treg. These mice rejected B16, indicating that CD4+ effector cells can induce tumor rejection even in the presence of Treg. These results are consistent with a previous study in which three mice that were adoptively transferred with CD4+ T cells from donors immunized with B16 and treated with anti-CD25, rejected tumors (3). Because our results indicate that IFN-γ and FasL are required for DTA-1-mediated B16 rejection, these cytolytic mechanisms, especially FasL, may be involved in CD4+ rejection of B16. Future adoptive transfer experiments using CD4+ T cells deficient in FasL or other effector molecules will elucidate the pathways involved in CD4+ DTA-1-mediated tumor rejection. Our data indicate an important role for IFN-γ in B16 rejection, consistent with its role in immunosurveillance and tumor rejection (31). Although IFN-γ produced by CD8+ T cells responding to CTL epitopes inhibit the generation/activation of CD4+CD25+ Tregs (41), recent studies have indicated that IFN-γ production by Treg is required for suppression (42, 43, 44). Our results demonstrate that the predominant role for IFN-γ in GITR-dependent tumor rejection is on effector T cells, because GITR stimulation does not protect IFN-γ−/− hosts from B16 challenge. Finally, we hypothesize that priming against tumors occurs and is strongly enhanced by GITR stimulation. We believe that GITR stimulation may enhance antitumor immunity through a very potent costimulatory signal on effector cells, which allows for its remarkable activity against nonimmunogenic aggressive tumors such as B16. This strong costimulation of effector T cells allows for long-term memory to be generated. Although other groups have determined that GITR stimulation inhibits Treg suppression (9, 10, 11, 12), our experiments do not demonstrate that GITR stimulation abrogates Treg suppression, but clearly demonstrate that GITR costimulation of effector T cells allows for rejection of the aggressive B16 melanoma line. Future experiments with T cells deficient in GITR (GITR−/−) will demonstrate whether tolerance/ignorance is broken through a strong costimulatory signal provided by GITR stimulation to the effector T cells or whether, as other groups have determined, it is due to GITR stimulation on Treg that abrogates suppression. Overall, our results in preclinical mouse models for cancer rejection indicate that systemic GITR stimulation breaks self-tolerance/ignorance, allows for recognition of tumor Ags, and induces tumor rejection. GITR stimulation is a potent and promising strategy to enhance tumor immunotherapy without the detrimental effect of autoimmunity. T. Ramirez-Montagut thanks Humilidad Gallardo and Nathalie E. Blachere for helpful comments and Robert B. Darnell for his support in the elaboration of this manuscript. ↵1 This work was supported by Grants HL69929, HL72412, and CA107096 from the National Institutes of Health, Awards from the Emerald Foundation and The Experimental Therapeutics Center of Memorial Sloan-Kettering Cancer Center funded by William H. Goodwin and Alice Goodwin, the Commonwealth Foundation for Cancer Research (to M.R.M.v.d.B. ), National Cancer Institute Grants CA33049, CA56821, CA47179, CA59350, and Swim Across America (to A.N.H.). ↵3 Abbreviations used in this paper: Treg, regulatory T cell; TNFR, TNF receptor; GITR, glucocorticoid-induced TNFR family related gene; FasL, Fas ligand. Ramirez-Montagut, T., M. J. Turk, J. D. Wolchok, J. A. Guevara-Patino, A. N. Houghton. 2003. Immunity to melanoma: unraveling the relation of tumor immunity and autoimmunity. Oncogene 22: 3180-3187. Turk, M. J., J. D. Wolchok, J. A. Guevara-Patino, S. M. Goldberg, A. N. Houghton. 2002. Multiple pathways to tumor immunity and concomitant autoimmunity. Immunol. Rev. 188: 122-135. Golgher, D., E. Jones, F. Powrie, T. Elliott, A. Gallimore. 2002. Depletion of CD25+ regulatory cells uncovers immune responses to shared murine tumor rejection antigens. Eur. J. Immunol. 32: 3267-3275. Tanaka, H., J. Tanaka, J. Kjaergaard, S. Shu. 2002. Depletion of CD4+CD25+ regulatory cells augments the generation of specific immune T cells in tumor-draining lymph nodes. J. Immunother. 25: 207-217. Shimizu, J., S. Yamazaki, S. Sakaguchi. 1999. Induction of tumor immunity by removing CD25+CD4+ T cells: a common basis between tumor immunity and autoimmunity. J. Immunol. 163: 5211-5218. Steitz, J., J. Bruck, J. Lenz, J. Knop, T. Tuting. 2001. Depletion of CD25+CD4+ T cells and treatment with tyrosinase-related protein 2-transduced dendritic cells enhance the interferon α-induced, CD8+ T-cell-dependent immune defense of B16 melanoma. Cancer Res. 61: 8643-8646. Shimizu, J., S. Yamazaki, T. Takahashi, Y. Ishida, S. Sakaguchi. 2002. Stimulation of CD25+CD4+ regulatory T cells through GITR breaks immunological self-tolerance. Nat. Immunol. 3: 135-142. Uraushihara, K., T. Kanai, K. Ko, T. Totsuka, S. Makita, R. Iiyama, T. Nakamura, M. Watanabe. 2003. Regulation of murine inflammatory bowel disease by CD25+ and CD25−CD4+ glucocorticoid-induced TNF receptor family-related gene+ regulatory T cells. J. Immunol. 171: 708-716. McHugh, R. S., M. J. Whitters, C. A. Piccirillo, D. A. Young, E. M. Shevach, M. Collins, M. C. Byrne. 2002. CD4+CD25+ immunoregulatory T cells: gene expression analysis reveals a functional role for the glucocorticoid-induced TNF receptor. Immunity 16: 311-323. Ronchetti, S., O. Zollo, S. Bruscoli, M. Agostini, R. Bianchini, G. Nocentini, E. Ayroldi, C. Riccardi. 2004. GITR, a member of the TNF receptor superfamily, is costimulatory to mouse T lymphocyte subpopulations. Eur. J. Immunol. 34: 613-622. Ji, H. B., G. Liao, W. A. Faubion, A. C. Abadia-Molina, C. Cozzo, F. S. Laroux, A. Caton, C. Terhorst. 2004. Cutting edge: the natural ligand for glucocorticoid-induced TNF receptor-related protein abrogates regulatory T cell suppression. J. Immunol. 172: 5823-5827. Muriglan, S. J., T. Ramirez-Montagut, O. Alpdogan, T. W. Van Huystee, J. M. Eng, V. M. Hubbard, A. A. Kochman, K. H. Tjoe, C. Riccardi, P. P. Pandolfi, et al 2004. GITR activation induces an opposite effect on alloreactive CD4+ and CD8+ T cells in graft-versus-host disease. J. Exp. Med. 200: 149-157. Valzasina, B., C. Guiducci, H. Dislich, N. Killeen, A. D. Weinberg, M. P. Colombo. 2005. Triggering of OX40 (CD134) on CD4+CD25+ T cells blocks their inhibitory activity: a novel regulatory role for OX40 and its comparison with GITR. Blood 105: 2845-2851. Kanamaru, F., P. Youngnak, M. Hashiguchi, T. Nishioka, T. Takahashi, S. Sakaguchi, I. Ishikawa, M. Azuma. 2004. Costimulation via glucocorticoid-induced TNF receptor in both conventional and CD25+ regulatory CD4+ T cells. J. Immunol. 172: 7306-7314. Kohm, A. P., J. S. Williams, S. D. Miller. 2004. Cutting edge: ligation of the glucocorticoid-induced TNF receptor enhances autoreactive CD4+ T cell activation and experimental autoimmune encephalomyelitis. J. Immunol. 172: 4686-4690. Tone, M., Y. Tone, E. Adams, S. F. Yates, M. R. Frewin, S. P. Cobbold, H. Waldmann. 2003. Mouse glucocorticoid-induced tumor necrosis factor receptor ligand is costimulatory for T cells. Proc. Natl. Acad. Sci. USA 100: 15059-15064. Turk, M. J., J. A. Guevara-Patino, G. A. Rizzuto, M. E. Engelhorn, S. Sakaguchi, A. N. Houghton. 2004. Concomitant tumor immunity to a poorly immunogenic melanoma is prevented by regulatory T cells. J. Exp. Med. 200: 771-782. Calmels, B., S. Paul, N. Futin, C. Ledoux, F. Stoeckel, B. Acres. 2005. Bypassing tumor-associated immune suppression with recombinant adenovirus constructs expressing membrane bound or secreted GITR-L. Cancer Gene. Ther. 12: 198-205. Fidler, I. J., G. L. Nicolson. 1978. Tumor cell and host properties affecting the implantation and survival of blood-borne metastatic variants of B16 melanoma. Isr. J. Med. Sci. 14: 38-50. Poste, G., J. Doll, I. J. Fidler. 1981. Interactions among clonal subpopulations affect stability of the metastatic phenotype in polyclonal populations of B16 melanoma cells. Proc. Natl. Acad. Sci. USA 78: 6226-6230. Ponomarev, V., M. Doubrovin, I. Serganova, J. Vider, A. Shavrin, T. Beresten, A. Ivanova, L. Ageyeva, V. Tourkova, J. Balatoni, et al 2004. A novel triple-modality reporter gene for whole-body fluorescent, bioluminescent, and nuclear noninvasive imaging. Eur. J. Nucl. Med. Mol. Imaging 31: 740-751. Overwijk, W. W., A. Tsung, K. R. Irvine, M. R. Parkhurst, T. J. Goletz, K. Tsung, M. W. Carroll, C. Liu, B. Moss, S. A. Rosenberg, N. P. Restifo. 1998. gp100/pmel 17 is a murine tumor rejection antigen: induction of “self”-reactive, tumoricidal T cells using high-affinity, altered peptide ligand. J. Exp. Med. 188: 277-286. Seaman, W. E., M. Sleisenger, E. Eriksson, G. C. Koo. 1987. Depletion of natural killer cells in mice by monoclonal antibody to NK-1.1: reduction in host defense against malignancy without loss of cellular or humoral immunity. J. Immunol. 138: 4539-4544. Kurosawa, S., M. Harada, G. Matsuzaki, Y. Shinomiya, H. Terao, N. Kobayashi, K. Nomoto. 1995. Early-appearing tumour-infiltrating natural killer cells play a crucial role in the generation of anti-tumour T lymphocytes. Immunology 85: 338-346. Leist, T. P., M. Kohler, M. Eppler, R. M. Zinkernagel. 1989. Effects of treatment with IL-2 receptor specific monoclonal antibody in mice. Inhibition of cytotoxic T cell responses but not of T help. J. Immunol. 143: 628-632. Moreau, J. L., M. Nabholz, T. Diamantstein, T. Malek, E. Shevach, J. Theze. 1987. Monoclonal antibodies identify three epitope clusters on the mouse p55 subunit of the interleukin 2 receptor: relationship to the interleukin 2-binding site. Eur. J. Immunol. 17: 929-935. Lowenthal, J. W., P. Corthesy, C. Tougne, R. Lees, H. R. MacDonald, M. Nabholz. 1985. High and low affinity IL 2 receptors: analysis by IL 2 dissociation rate and reactivity with monoclonal anti-receptor antibody PC61. J. Immunol. 135: 3988-3994. Ikeda, H., L. J. Old, R. D. Schreiber. 2002. The roles of IFN γ in protection against tumor development and cancer immunoediting. Cytokine Growth Factor Rev. 13: 95-109. Stephens, G. L., R. S. McHugh, M. J. Whitters, D. A. Young, D. Luxenberg, B. M. Carreno, M. Collins, E. M. Shevach. 2004. Engagement of glucocorticoid-induced TNFR family-related receptor on effector T cells by its ligand mediates resistance to suppression by CD4+CD25+ T cells. J. Immunol. 173: 5008-5020. Hishii, M., J. T. Kurnick, T. Ramirez-Montagut, F. Pandolfi. 1999. Studies of the mechanism of cytolysis by tumour-infiltrating lymphocytes. Clin. Exp. Immunol. 116: 388-394. Homma, S., H. Komita, Y. Sagawa, T. Ohno, G. Toda. 2005. Antitumour activity mediated by CD4+ cytotoxic T lymphocytes against MHC class II-negative mouse hepatocellular carcinoma induced by dendritic cell vaccine and interleukin-12. Immunology 115: 451-461. Altomonte, M., E. Fonsatti, A. Visintin, M. Maio. 2003. Targeted therapy of solid malignancies via HLA class II antigens: a new biotherapeutic approach?. Oncogene 22: 6564-6569. Albino, A. P., A. N. Houghton, M. Eisinger, J. S. Lee, R. R. Kantor, A. I. Oliff, L. J. Old. 1986. Class II histocompatibility antigen expression in human melanocytes transformed by Harvey murine sarcoma virus (Ha-MSV) and Kirsten MSV retroviruses. J. Exp. Med. 164: 1710-1722. Corthay, A., D. K. Skovseth, K. U. Lundin, E. Rosjo, H. Omholt, P. O. Hofgaard, G. Haraldsen, B. Bogen. 2005. Primary antitumor immune response mediated by CD4+ T cells. Immunity 22: 371-383. Nishikawa, H., T. Kato, I. Tawara, H. Ikeda, K. Kuribayashi, P. M. Allen, R. D. Schreiber, L. J. Old, H. Shiku. 2005. IFN-γ controls the generation/activation of CD4+CD25+ regulatory T cells in antitumor immune response. J. Immunol. 175: 4433-4440. Sawitzki, B., C. I. Kingsley, V. Oliveira, M. Karim, M. Herber, K. J. Wood. 2005. IFN-γ production by alloantigen-reactive regulatory T cells is important for their regulatory function in vivo. J. Exp. Med. 201: 1925-1935. Kelchtermans, H., B. De Klerck, T. Mitera, M. Van Balen, D. Bullens, A. Billiau, G. Leclercq, P. Matthys. 2005. Defective CD4+CD25+ regulatory T cell functioning in collagen-induced arthritis: an important factor in pathogenesis, counter-regulated by endogenous IFN-γ. Arthritis Res. Ther. 7: R402-R415. Fallarino, F., U. Grohmann, K. W. Hwang, C. Orabona, C. Vacca, R. Bianchi, M. L. Belladonna, M. C. Fioretti, M. L. Alegre, P. Puccetti. 2003. Modulation of tryptophan catabolism by regulatory T cells. Nat. Immunol. 4: 1206-1212.